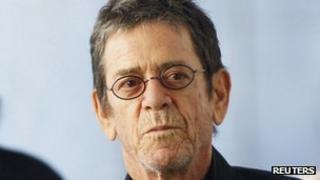 Former Velvet Underground frontman Lou Reed, who died after complications from a liver transplant on 27 October, has left his estate to his wife and other relatives, his will has revealed. He left his Manhattan penthouse, his home in East Hampton, New York, and the bulk of his estate to his wife, musician Laurie Anderson. His sister inherited about a quarter of his estate and a $500,000 (£313,185) bequest to care for their mother. Reed was 71 and had no children. The rocker married long-time partner Anderson in 2008. Tributes flooded in for Reed at the news of his death, including one from David Bowie who declared: "He was a master," and Reed's former Velvet Underground bandmate John Cale, who said: "The world has lost a fine songwriter and poet." Reed's second solo album Transformer, featuring Perfect Day and Walk on the Wild Side, was co-produced by Bowie. Other stars paying tribute included Iggy Pop, The Who, Motley Crue's Nikki Sixx, US singer Cyndi Lauper, Tom Morello, of Rage Against the Machine, actress Mia Farrow, British author Salman Rushdie and US actors Whoopi Goldberg and Samuel L Jackson. The Velvet Underground became renowned for their fusion of art and music and for collaborating with Andy Warhol. Although the band never achieved commercial success during the 1960s, their influence on music in later decades was widely recognised. The glam, punk and alternative rock movements of the 1970s, 80s and 90s were all indebted to Reed, whose songs were covered by the likes of REM, Bowie, Nirvana, Patti Smith and countless others. Music producer Brian Eno once summed up their influence by saying: "The first Velvet Underground album only sold 10,000 copies, but everyone who bought it formed a band." The group were inducted into the Rock and Roll Hall of Fame in 1996. After quitting The Velvet Underground in 1970, Reed released his self-titled debut in 1972, but it wasn't until the Bowie-produced LP Transformer later that year that he achieved chart success. Perfect Day enjoyed a revival in 1996 when it was featured in Danny Boyle's Trainspotting, and again a year later when it was re-recorded by a celebrity cast for a BBC charity single. As a solo artist, Reed released 20 studio albums. His last, Hudson River Wind Meditations, was released in 2007.